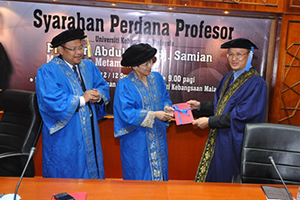 BANGI, 3 Sept 2012 – The study of Metamathematics is ideal for those who want to preserve their spirituality, especially for Muslims, according to a Professor of Philosophy at The National University of Malaysia, UKM. Professor of Philosophy and Director of the Institute of Malay World and Civilisation (ATMA) UKM, Professor Dr. Abdul Latif Hj Samian said the characteristics of Metamathematics are similar to the philosophy of Islam. Giving his inaugural lecture Mapping Metamathematics, Prof Abdul Latif said metamathematics is not about materialism alone but emphasises the metaphysical and discoveries in nature. Metamathematics is the branch of mathematics that analyzes the logic of mathematical thinking. It is mathematics that deals with the logic and consistency of mathematical proofs, formulae and equations. The aim of the philosophy of metamathematics is to provide an account of the nature and methodology of mathematics and to understand the place of mathematics in people’s lives. Prof Abdul Latif said during the renaissance a crisis occurred in the West that shook the confidence of the people as the discovery of more mathematical disciplines and non-Euclidean Geometry took hold. He said whereas to the ancient Greek mathematics emphasised lines and shapes, metamathematics requires more in-depth study and philosophy. Prof Abdul Latif said initially many thinkers did not fully appreciate mathematical knowledge until mathematicians such as Bertrand Russel and L Brouwer showed that mathematics could be studied spiritually. As for Islam, he said, the knowledge is based on the mathematical existence of God Almighty. It can motivate Muslims to unlock the secrets of the Universe. Mathematical problems are not only related to the distribution of zakat or the positioning of the Qibla but helping other people solve everyday problems in a variety of ways. Prof. Abdul Latif received his Masters of Science degree (MSc) from Indiana State University and his MA from Indiana University. 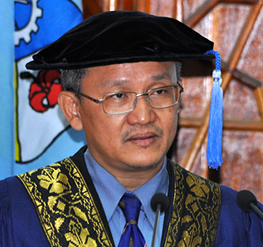 He obtained a Diploma in Education from UKM and completed his PhD at University of Malaya (UM). Among his numerous publications and his academic contributions are articles in The Encyclopaedia of the History of Science, Technology and Medicine in Non-Western Cultures, the journal Islamic Culture, Muslim Education Quarterly, Akademika, Sains Malaysiana, Pemikir, Kesturi, Hamdard Medicus, Jawhar, Islamiyyat, Journal of General Studies and Journal of Islamic Education. He also wrote and translated several books published by among others the Dewan Bahasa dan Pustaka, Oxford University Press and Springer, Netherlands, UKM and UM.